1) Har Meen/Penang Prawn Mee: After dropping my bags off upon my arrival at Sydney, my sister took me out to a small Malaysian eatery and I had this noodle soup. 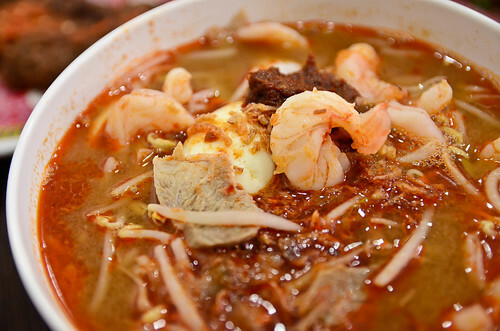 The broth is a spicy and pungent shrimp stock paired with egg and rice noodles, bean sprouts, and topped with bits of pork and fresh shrimp. A dollop of cooked chili sambal is obligatory to add the extra heat and richness to this dish. A great start to my trip especially since I was arriving in the middle of winter Down Under. 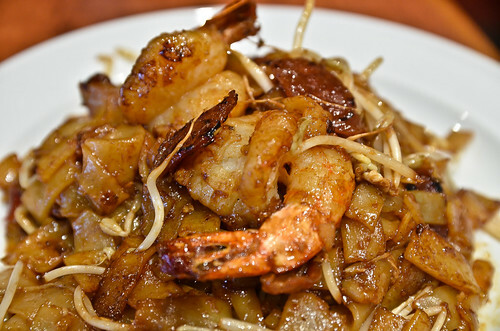 2) Chow Kueh Teow/Stir Fried Rice Noodles: This is a favorite among many Malaysians and it is usually the litmus test of the kitchen’s cooking level. 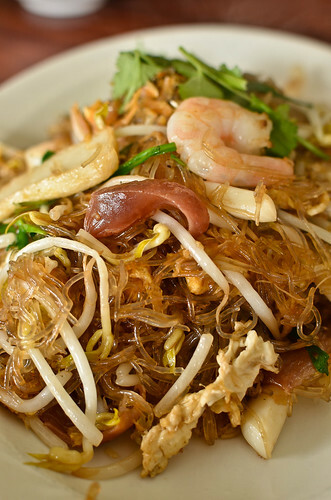 Broad rice noodles are stir fried with egg, bean sprouts, Chinese sausage, and shrimp. The addition of light and dark soy sauces gives it the distinctive flavor, and the high heat searing in the wok results in the characteristic caramelization. In the old days, a sprinkling of crispy pork fat and the use of lard were standard, which add a certain unctuousness, but seldom practised these days – what a pity. 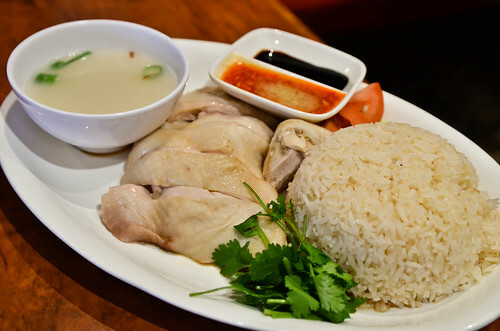 3) Hainanese Chicken Rice – Another popular dish. Chicken is lightly simmered to a point which the collagen under the skin is still intact and not cooked out. The broth is used to make the rice and the soup that are served together with the meat pieces. The sauces also take a prominent role since they are instrumental in adding flavor to the rather bland pieces of chicken: ginger chili sauce and thick soy sauce. A perfect lunch. 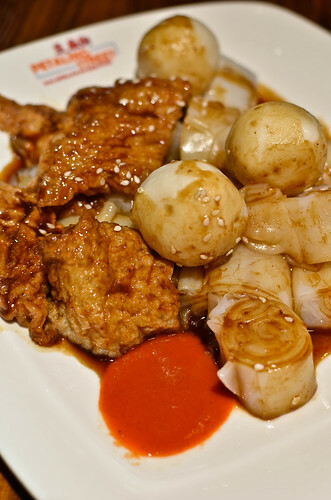 5) Chee Cheong Fun/Pig Intestine Noodles – OK, these are not porcine guts! They are steamed sheets of rice noodles that are rolled up and cut to resemble that animal part. The sides of cooked soybean sheets stuffed with fish paste and a few fish balls make this quite a complete meal. The dousing of sweet hoisin and chili sauces add the sweet, salty and spicy notes to this breakfast dish. This brings back memories of my mother buying it from the morning market for our breakfasts. 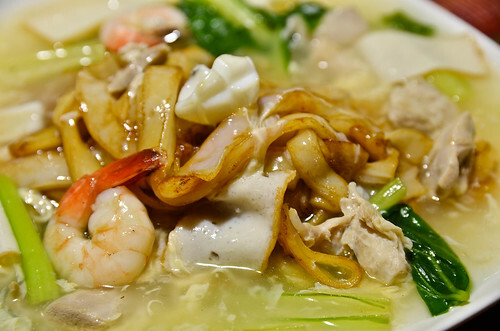 6) Wat Ton Hor Fun/Cantonese Style Noodles in Sauce – Pan-seared rice noodles are doused in a light broth that has been enriched with egg whites, thus giving its name of “smooth egg sauce”. Bits of shrimp, squid, pork, and fresh vegetables make this dish well-balanced in flavor and as a complete meal. The addition of pickled green chilis aids in cutting through the savory sauce as well as providing the spicy note to this otherwise mild dish. 7) Kueh Chang Nyonya/Nyonya Stuffed Rice Dumplings – This rice dumpling comes specifically from the Peranakan culture to which I belong. 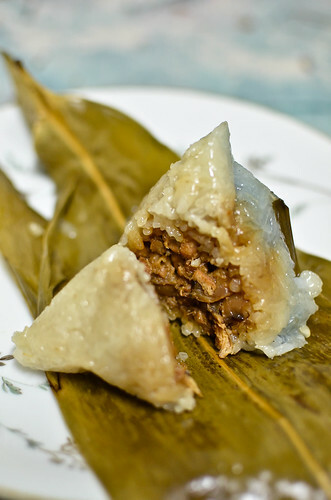 It is glutinous rice stuffed with a savory and fragrant concoction of pork, chinese mushrooms, candied melon, and coriander powder. The dumpling is wrapped in bamboo leaves and boiled until completely cooked with the dumpling having absorbed the aroma imparted by the leaves. The customary light blue coloring comes the use of a pea flower. This was a favorite of mine growing up and it reminds me of watching my paternal grandmother making these dumplings specifically for the Summer Solstice, June 22nd. 8) Banana Leaf Rice – With a rather sizable South Indian population in Malaysia, many folks have taken a liking to this tasty meal that is served on Banana leaves. 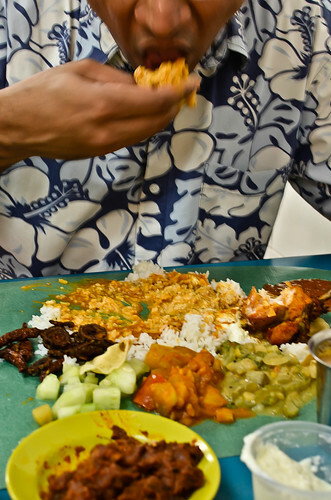 Servers will come around and pile on top of the rice scoops of curries, meat, fish, vegetables, pickles, and crackers. It is one of the rare opportunities when I get to “play” with my food with my hands and eat it with no utensils. Unfortunately, the use of banana leaves has fallen to the wayside and they have been replaced by paper made to look like the leaves themselves. Thanks to my college buddy, Vijay (yes, that’s him stuffing his face), and his wife, Yvonne, for taking me out for this great treat. 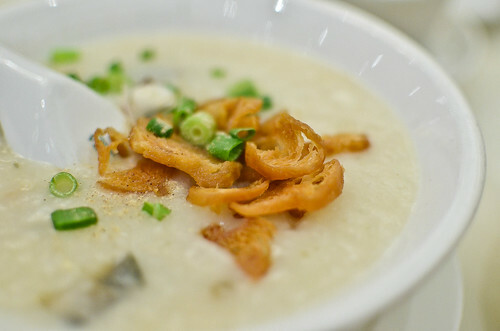 9) Thousand-Year Egg and Pork Rice Congee – This breakfast staple is a rather humble and simple dish that has been elevated to a more refined version found in Dim Sum houses. This rendition has a smoother texture that has been enriched by the use of meat stock and the addition of lean pork meat and the strong-tasting thousand-year egg. The addition of fried Chinese croutons adds the textural contrast to the gruel-like dish. This reminds me of a raw fish version that my grandmother used to take us to in Petaling Street for breakfast when I was a young child. Simple yet soulful. 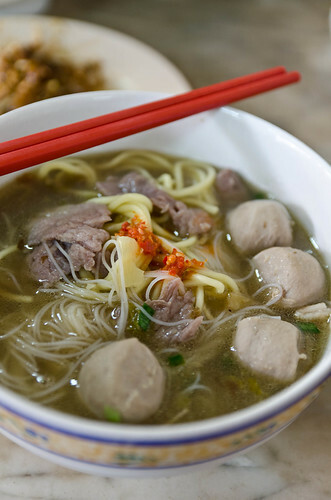 10) Ngow Nam Meen/Beef Noodle – This famous dish has been served at the same location, Lai Foong Coffee shop (see first photo), for as long as I recall, on the edge of Chinatown. Slices of beef with beef balls are paired with noodles, salted radish, pickled mustard green, all tied-in by a rich beefy broth. The chili sauce side is mandatory to cut through the richness of the dish. However, during my last visit, I was a bit disappointed by the slight insipidness of the broth and the lack of the sour mustard green that I recall from yesteryear. But it was definitely worth the visit just for memory sake. 11) Mee Suah – This dish hails from my Peranakan roots and I was pleasantly surprised by its presence for breakfast one morning at my aunt’s place. It is very fine vermicelli noodles cooked in a meat broth and served with some minced meat, white pepper and fried shallots. 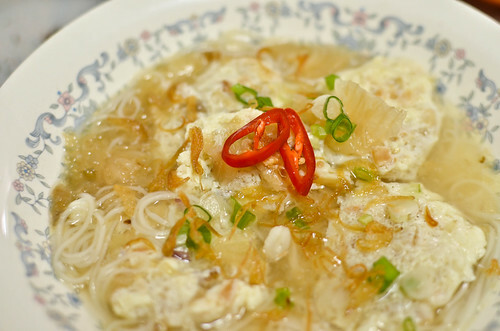 That morning, it was served with fluffy eggs mixed with dried shrimp, which was equally delectable. This was a rare treat for me and a great start for the day. 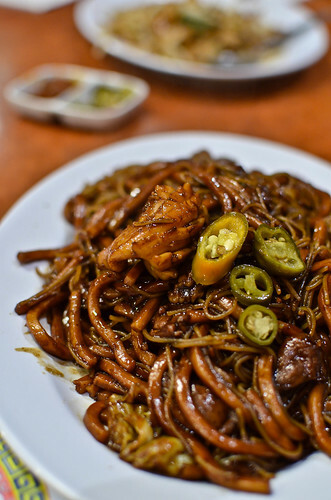 12) Kari Mee/ Curry Noodles – Malaysians never get enough of spiciness especially the curries that have been influenced by the Malay and Indian cultures. Here, we see a marriage of a curry dish with Chinese noodles. But this version takes it another level with the addition of roast pork, cockles and braised chicken feet. Yes! I love chicken feet and most of you will be grossed out by this, especially the fact that I enjoy it for breakfast too. The squeeze of Kalamansi lime provides the citrus hit that cuts through the richness and spiciness. 13) Lam Meen – My auntie took me to a coffee shop for breakfast after paying respects to our ancestors at the cemetery. 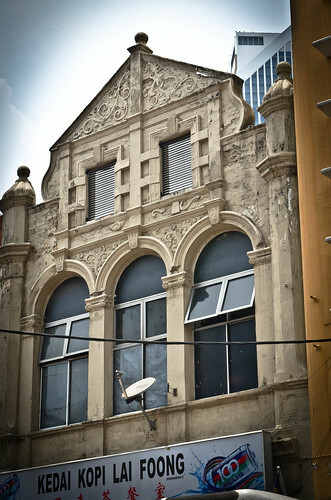 This place is reputed to serve the best Lam Meen in town. It is thick wheat noodles, cooked al dente, enveloped by a thick tasty broth studded with pieces of chicken and shrimp. This reminded me of my maternal grandmother’s version that she would cook for our Saturday lunches – a classic Cantonese noodle dish. 14) How can you spot a Malaysian? By the amount of fresh-cut chilies that he/she is consuming with the noodle and rice dishes. 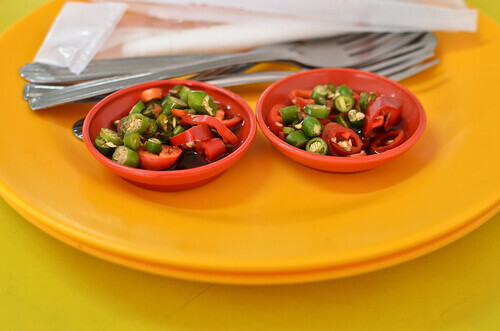 A bowl of cut chilies is de rigueur with the meal and they are served in both coffee shops and high-end restaurants. My maternal grandmother even brought a jar of this condiment to Hong Kong years ago to spice up the rather mild Cantonese dishes. No doubt she inculcated the love for pickled green chilies in me – can’t get enough of them! 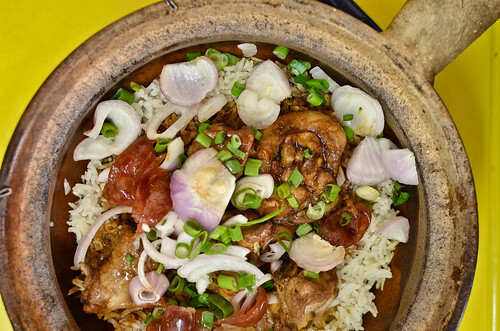 15) Nga Po Kai Fan/ Clay Pot Chicken Rice – This is one dish that was a must-have on my trip to Malaysia and they are served in local coffee shops around the city. Cooked white rice is served in searing-hot clay pots, topped with pieces of chicken, Chinese sausage, and seasoned with light and dark soy sauces. The mixture is mixed well before serving, while the heat from the pot crisps up the bottom of the rice, much like a Asian savory rice krispies. Bits of sweet raw onions and green onions provide the fresh flavors to this rich-tasting dish. I’m glad my cousin took me all the way across town when another eatery was not open during lunch. 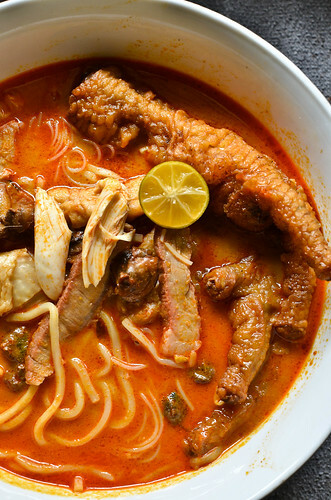 16) Laksa Lemak/Curry Noodle Soup – The quintessential lunch noodle dish encapsulates Southeast Asian flavors with a spicy broth enriched by coconut milk, and spiced by lemongrass and Kafir lime leaves. The bowl I had while I was visiting my parents in Melbourne was replete with bits of squid, shrimp, mussels and fresh vegetables, which made it a seafood delight. Bits of fried tofu are obligatory in this dish that add a lightness to this rich dish. 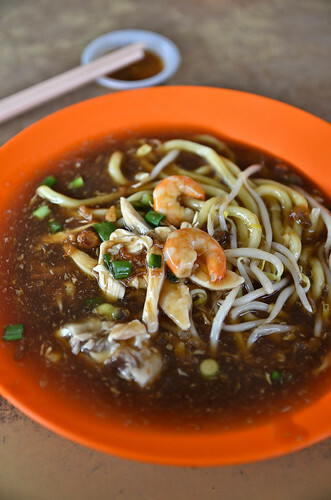 17) Hokkien Mee – This noodle dish traces its roots to the Fujian area from which many Malaysian Chinese can claim their roots. It is thick wheat noodles and rice vermicelli that are wok-seared with lard, seafood and the distinctive dark soy sauce that adds a slight sweetness from the molasses flavored sauce. The addition of crispy pork fat adds the necessary richness to the dish, as how it was served to me in Australia. 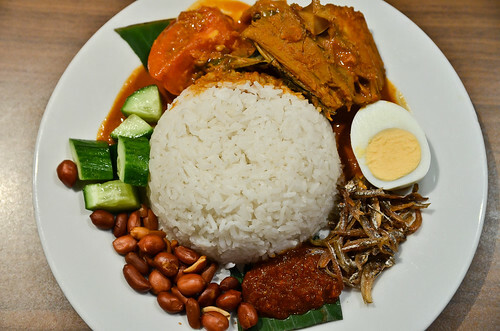 This dish brings back memories of my father driving to downtown Kuala Lumpur and parking on the main street as we waited for our late night supper, usually after a badminton game – such maneuver is not possible anymore with the crazy traffic nowadays. 18) Chow Toong Fun/Fried Beanthread Noodles – This is a dish that I have not eaten much of but I appreciate its lightness due to the use of noodles made from Mung beans, those used to make bean sprouts. Again, like most noodles, we get Surf and Turf here with the use of Chinese sausage and shrimp. The addition of bean sprouts adds the necessary crunch to the delicate noodles. 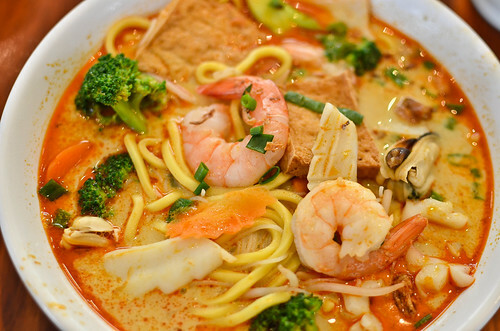 19) Assam Laksa – This complex tasting dish hails from the northern island of Penang where there is a strong Thai influence from its neighboring territories. 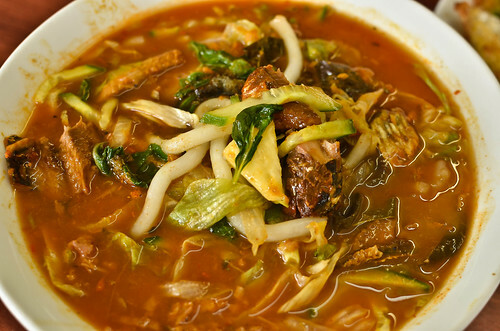 The soup is spicy, fragrant, and sour from the use of tamarind as its base. The use of Spanish mackerel or sardines adds to the rich flavors, while the use of mint, pineapple and cucumber brings fresh qualities to this rather “dark” soup. It is a favorite of mine and I definitely miss my grandmother’s rendition that she would whip up for our wonderful Saturday lunches. Oodles of noodles and plates filled with flavored rice. As you can see, we can’t get enough of these staples, considering the variety of dishes that they come in and the myriad of flavors that satiate the hungry eater. Just don’t forget to ask for another serving of fresh chilies or chili paste that will make this culinary experience both fiery and complete. When in Malaysia, eat like a Malaysian, which means with lots of chilies. No doubt! Alex, I am glad you were able to get some good food during your travels. Thanks for sharing this posting with us. Thank you for posting it on your page. After reading this, I think that I may have enjoyed Australia from a culinary point of view more than from a scenic/tourist vantage point. Such fine dining would have had me speaking Malay fluently before returning to Chicago. We must do a culinary trip together one day. It looks like you had a great eating holiday. I remember going to Lai Foong a couple of years ago and thinking that the broth didn’t have the same intensity as before. The Dan Tarts sold at the entrance were still good though. Apparently the food court in Lot 10 is one of the best places for hawker stall food in KL. Went there once – loved it!!! Thanks. I will head to Lot 10 next time. I was wondering what happened to you Alex. These pics are amazing and really are showing all the hard work you’re doing to get a beautiful food capture. Great job! Thank you for the complement. I’m enjoying the process, and the eating, obviously. All of this made my mouth water….what a wonderful trip you had. Thanks for sharing! Thanks for the comment. Glad I could make you salivate.